All images used with permission and are © 2012-2017 by Trickster Arts. Full version: *.ods Dropbox Link Click Link > Open > Open in LibreOffice Calc > Save File. Includes all calculators, Reference images, Form reset macros. A new Calculator has appeared! Time/Date cells should now be viewable at smaller resolutions. 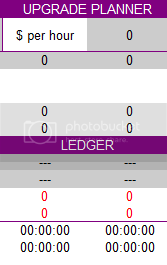 Reset Ledger should now reset smoothly. Program list is now in the same order as Evolver for easier to input values. Program Calculator is now in the same order as the Security Log to make it easier to input values of your recent hacks. Program Listings: View and Store program information for current and future levels. 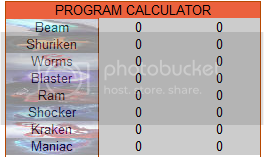 Program Calculator: Review B-coin costs, program slots used and time cost to compile programs. Multiple slots available for comparing different sets of programs. 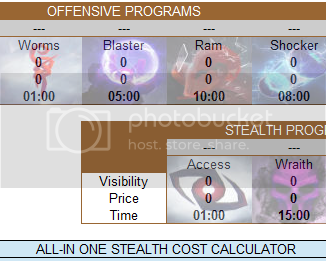 Stealth Calculator: Review the visibility costs of stealth attacks, either for attacking others or for defending your own network. Supports multiple Scanner levels, Accessed Code Gates, B-coin costs of stealth attacks, safety values and much more! Compiler Rush Cost Table: Review compiler times and credit costs, for rushing your compiler programs as cheap as possible. Resource Calculator: Review resources gained over a period of time, ideal for 9SEC users! Building Calculator: Review current and future build times along with future program times, funds required and shortest completion times. Upgrade Calculator: A combination resource and building calculator. Plan up to 9 upgrades, with seperate completion times for building threads and Evolvers. Also capable of comparing times of different upgrade combinations. Profitability calculator: Review target loots and if it's worth attacking given your program costs. Multiple slots to compare all 5 map targets. Data Leech Calculator: Based on my original work here, calculate the visibility cost for stealth - and the time cost for brute force - of multiple Data Leeches. Last edited by Luminaar on Tue Mar 07, 2017 1:08 am, edited 2 times in total. Last edited by emanon on Sat Feb 04, 2017 1:14 am, edited 1 time in total. Thanks for the feedback guys. Next thing on the list, Blasters vs Gates!